What Happens When You Shrink a Tiny URL? As you may know, there are a number of URL shortening services that help shorten a URL down to about a dozen characters so that you can include links in Twitter and social network updates. The “who’s best” jury is still out on tinyurl vs bitly vs twurl vs trim (and more…) – but all of these services allow you to enter a URL and get it shortened. 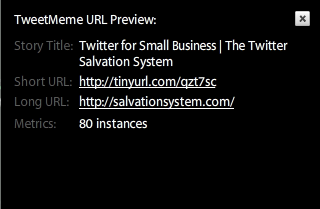 So, I almost outsmarted the shortened URL preview window in TweetDeck. But not quite. Which is fine, because at least I can always see the Story Title and will be less likely to end up on a site I don’t want. On a related side note. 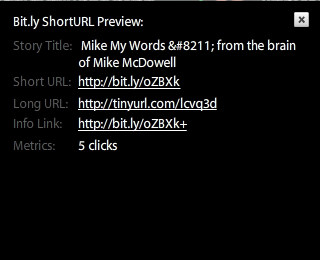 TinyURL will not let you shorten a URL that has already been shortened (like a bit.ly URL), neither will Trim.